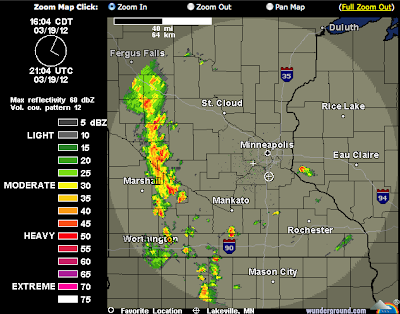 It would have been interesting to see what the software 'RainAware' (discussed on this site in the past) would have shown for Lakeville during this time! @DysonGuy Indeed, it would have been interesting. 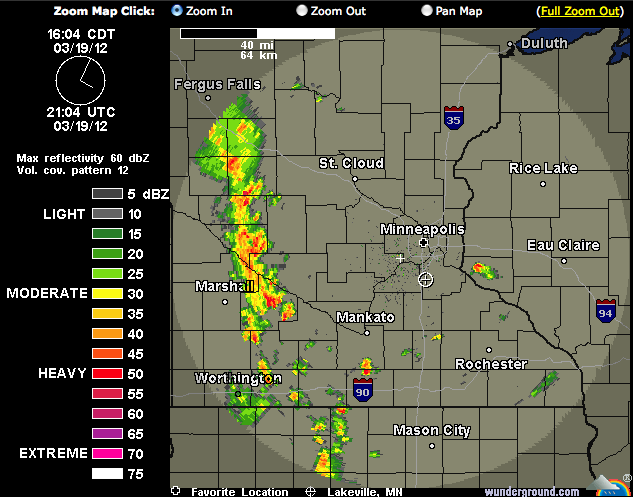 So far, I'm pleased with RainAware. It seems to function as an informed observer of the radar and a good match for humans. Not that I really care what local TV weather actors do, but are these Yuhas tweets done under the auspices of his employer? Or is it something he does for fun? If it's part of his job, then yes, I think he's wrongly lead people astray. I think you have to see them as part of his employment. That's why he has the platform he does. Not only was he wrong, but is something like that really worth tweeting? It would be one thing if it was already a nasty storm with history of producing hail or gusty winds, but it is a yellow speck that probably amounted to 30 seconds of rain for those it hit. Makes no sense at all. He must be trying to prove his worth or something. To the TMF site readers I think many of you may have seen what I posted on March 19th at 10:02am.. Since I'm not on Twitter or Facebook (for privacy reason's, after all we have all heard about employer's asking for facebook passwords), I don't know what other mets were tweeting. IMO Jonathan saw the same set up I was seeing, (timing just a little off,can't trust models with timing). He saw the threat and tweeted what he thought was a prudent thing to do, trying to raise the overall threat to his follower's. 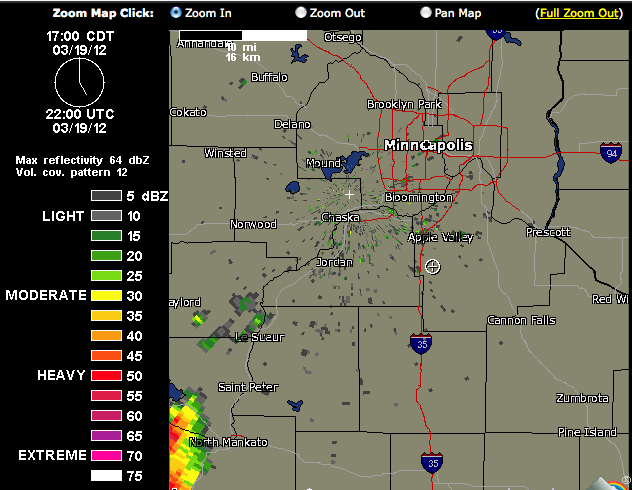 At 625 pm a tornado touched down in Elysian MN. As Mr Brickmann said in a recent interview that was posted at this site, one of the biggest challenges he has since he moved here is forecasting for a entire state, after all the local markets like Duluth and Rochester etc only forecast for their viewing area, the Metro stations are far more reaching. So my question to those of you that follow the mets and their tweet's, did they adequately alert the area of the severe potential? I saw larger Convective Available Potential Energy (cape) numbers were forecast to pour into the metro from the se, suggesting the winds would turn to the se (which they did) while at the same time the wind just west of the metro would be out of the WSW, allowing for the chance of twisting in lower atmosphere, thus enhancing the treat of severe weather. I don't want to put words in Jonathan's mouth, but if he was the only met out there that was relaying the T-storm threat, than I say job well done!!! It was a precursor as to what was to come - to another area, not the one he was forecasting. I think he was just jumping the gun on the weather that is to come. 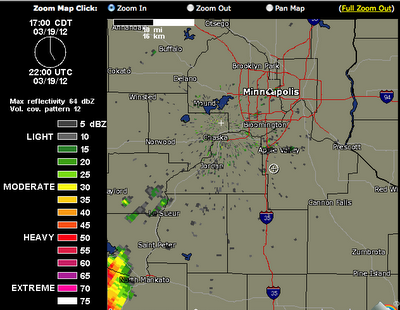 Soonn we will have the big storms where established cells are more forecastable. Love this continued warm air and rain. Grass is just so green. Snow on the long range models?